Amanda and Alligator are BFFs. Alligator pines and waits impatiently when Amanda is gone from his home in her room, even when she comes back with a stack of library books to read with him. She always has a surprise for him, and sometimes Alligator has a surprise in wait for her! "SOMETHING TICKLES," SAID ALLIGATOR. AMANDA WAS READING HER LIBRARY BOOK. "I DO!" YELLED ALLIGATOR. AND HE DID! Amanda loves Alligator's silly joke, giggling appropriately as he tickles her, and Alligator is proud of his surprise. But then he notices that something really is tickling him. "THAT'S A FUNNY JOKE," SAID AMANDA, "BUT I AM NOT GOING TO FALL FOR IT AGAIN." "NO, REALLY," SAID ALLIGATOR. SOMETHING WAS ATTACHED TO HIS TAIL. "IT'S A PRICE TAG!" SAID AMANDA. "IT SAYS SEVEN CENTS," SAID AMANDA. "SEVEN CENTS? I AM WORTH ONLY SEVEN CENTS?" "NO ONE WANTED TO BUY YOU," SAID AMANDA, "BECAUSE THEY KNEW YOU WERE MEANT TO BE MY BEST FRIEND." Alligator is happy, secure that he is Amanda's best friend for life. But then comes the worse surprise ever. Amanda goes out and comes back to their room with a brand-new Panda, one that Alligator is sure did NOT come from any sale bucket. Will Alligator be Amanda's best friend no more? 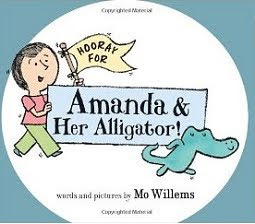 Mo Willems' just-out Hooray for Amanda & Her Alligator! (HarperCollins, 2011) adds a new pair to his repertoire of beginning reader best pal books. Willems' easy cartoon style and matter-of-fact style of droll storytelling, best illustrated in his Seuss Award-winning series Elephant and Piggie, here finds a new hero and heroine to explore the dimensions of friendship for the emergent reader.